Description Also known as R 15 Properties FormSyrup Weight442 (gms) Dimensions6.3 (cm) x 6.3 (cm) x 15.8 (cm) R15 F (Vita C Forte) Nervous exhaustion, nervous headache, insomnia, general neurasthenia, stimulative of endogenous resistance, overexertion, depressions, inability to concentrate, lack of energy, impotency, spring fatigue, convalescence. General physical invigoration. The feeling of exhaustion subsides and there is a return of the energy to work. Action of composition used in R15 (vita C forte) Acid phos : Physical and mental weakness, weakness of back sacral region, inability to do mental work. Consequences of grievances and worries. Indifference and discouragement. Drowsiness during day, dislike to converse, pollutions, impotency. Citrus medica Iimonum: Effect on the circulation and the blood itself, faintness, weak pulse. Cocculus: Physical weakness, exhaustion, irritability, state of depression, insomnia, weakness of muscles of the nape, with feeling of heaviness in head. Ginseng: Nervous exhaustion, fatigue accompanied by lumbar weakness, difficulty in thinking, sexual asthenia. Helonias: exhaustion and overexertion (especially of women), accompanied by uterine affections nervous irritations, depressions, desire for solitude. Sepia: Sadness, irritable and moody, Indifference to duties, especially with women in the climacteric period. Zincum met: Great nervous exhaustion, restlessness of the legs, irritability of the nervous system, taciturnity, slow mental conception, weak memory, burning and weakness along spinal cord, pricking and numbness of the limbs. 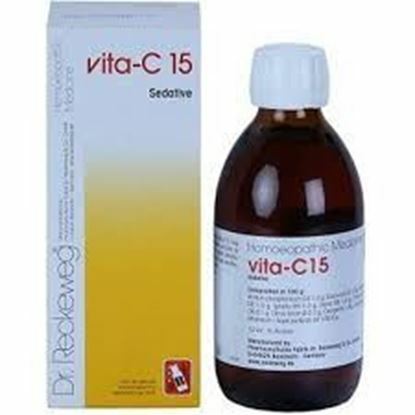 Dosage of R15 F (Vita C Forte) We recommend VITA-C 15 FORTE every time prior to expected stress-situations, to achieve a remarkable invigoration of the nervous system, 2 daily supplies(morning and evening) for 6 days and continue with one daily dose for about three weeks. 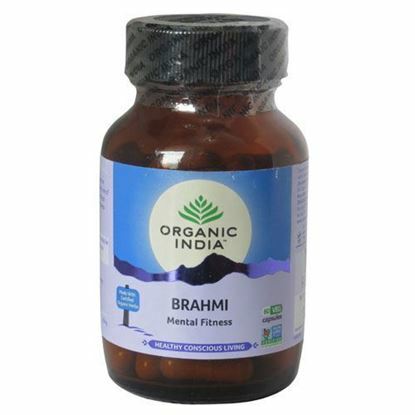 Also known as R 14 Properties FormDrops Weight69 (gms) Dimensions3 (cm) x 3 (cm) x 9 (cm) Indications of Dr. ReckewegR14 Insomnia and various disturbances of the sleep, superficial sleep, light sleep, sleeplessness, drowsiness in the morning, weariness during the day, vivacity in the evening. Nervous restlessness and over-excitement of the nervous system. Neurasthenia, consequences of mental conflicts of long duration. 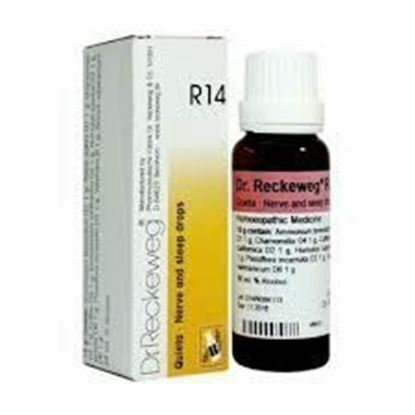 Mode of Action of Main Ingredients in Dr. Reckeweg R14 Influences favourably the regularizing of disturbed sleep, and neurasthenic symptoms. Ammonium bromatum: Sedative. Avena sativa: General nervous weakness and sexual neurasthenia, consequences of mental overexertion. Convalescence. Sleeplessness in spite of lassitude. Chamomilla: Effective in overstimulated nervous system with hypersensitivity. Uneasy sleep. Eschscholzia: Sedative. Humulus lupulus: General nervous exhaustion, neurasthenia, hypochondria, sedative. Ignatia: Nervous exhaustion and irritability resulting from psychic afflictions of a depressing nature, following grief or worry. Egocentric solitude. Passiflora incarnata: Sedative. Unrest and irritability of the nervous system. Mental and physical vivacity when trying to sleep, full of ideas, disturbed non-refreshing sleep Valeriana: Light sleep, non-refreshing. Nervous weakness and restlessness. Zincum valerianicum: Insomnia with twitching in limbs, nightmares, restlessness of the legs. Dosage of Dr. ReckewegR14 In extreme nervous exhaustion and insomnia, 3 times a day 10-15 drops in some water, at night 20 drops in some sweetened water. In most cases general relief and a less agitated sleep follow after several days. Thereupon, 10-15 drops once or twice daily ought to suffice. However, Dr. ReckewegR14 acts differently on various individuals. Patients sensitive to medicine very often experience an aggravation, chiefly of insomnia. In such cases the dose should immediately be reduced to 5 drops 3 times a day, sometimes even less, even down to once only during the day (not recommended in the evening). Dosage should be adapted to the individual. In some cases, 20-30 drops 3 times a day may have to be taken to obtain any effect. However, before increasing the dose it would be advisable to observe the action of the medicine for several days. Regular treatment should be continued for a longer period of time even after complete recovery, at the rate of 10-15 drops taken in the evening. Terms and Conditions We have assumed that you have consulted a physician before purchasing this medicine and are not self medicating.